The difficulties in moving towards corporate sustainability raise the question of how environmental and social management can be integrated better with economic business goals. Over the last decade, the relationship between environmental and economic performance, and more recently the interaction between sustainability performance and business competitiveness, have received considerable attention in both theory and practice. However, to date, only partial aspects of the relationship between sustainability performance, competitiveness and economic performance have been studied from a theoretical as well as an empirical perspective. And, to date, no unique relationship has prevailed in empirical studies. A number of explanations have been put forward to explain this, including methodological reasons, such as the lack of statistical data, the low quality of that data, or the fact that such data is often available for short time periods only. Other theoretical explanations have been developed, such as the influence of different corporate strategies or the relatively small influence of environmental or sustainability issues as one factor among many on the economic or financial success of firms. So, how should the business case for sustainability be managed? This is the starting point for this book, which compiles insights on a large number of aspects of the link between sustainability performance, business competitiveness and economic success in an attempt to provide a comprehensive and structured view of this relationship. The book provides an unrivalled body of knowledge on the state of theory and practice in this field and identifies prospective future fields of work. The book includes: conceptual frameworks for the interaction of social, environmental and economic issues in business environments; case studies of companies that have successfully integrated social, environmental and economic issues; analyses of the causal and empirical relationship between environmental and/or social performance, business performance and firm-level competitiveness; concepts and tools useful for improving business value with proactive operational strategies; assessment of the factors influencing operational sustainability strategies and their economic impact; and comparisons of interactions between sustainability performance and firm competitiveness across industry sectors and countries. 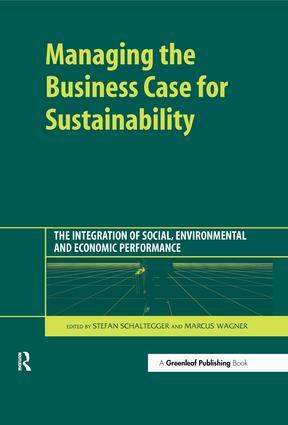 Managing the Business Case for Sustainability is the definitive work in its field: the most comprehensive book yet published on the theory and practice of managing sustainability performance, competitiveness, environmental, social and economic performance in an integrated way. It will be essential reading for managers, academics, consultants, fund managers, governments and government agencies, NGOs and international bodies who need a broad and comprehensive overview of the business case for sustainability.